When smoking a chillum a chillum stone is often inserted in the pipe to keep from directly inhaling debris much like a screen or filter is used in other pipes. They are generally tight fitting, conical with a flat top and usually have a small hole drilled down through the centre and slits down the sides to allow smoke to pass freely. Before they were commercially available people would search for the right sized pebble off the ground to fit their pipes. Some still do. According to Alfred Dunhill, Africans have long employed chillum-style pipes for smoking cannabis and later tobacco. Gourds and various horns were often employed while conical bowls were common in Uganda. One of the more famous pipes is an ivory cone pipe once belonging to "Waganda" monarch King Mtesa. More recently, it has also seen use in sacraments by Rastafari. Since the 1960s the embellished bamboo chillum has become an American folk art form. These pipes are handmade and often sold by the artists on street corners in places like the Haight-Ashbury district of San Francisco and the Greenwich Village area of New York City. As designs these contemporary smoking pipes recall traditional decorated bamboo pipes from Borneo, however, the American carved bamboo design often employs a brass lighting fixture for a bowl. 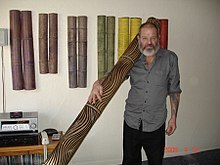 Since the 1970s, street artist Darrel "Pipeman" Mortimer of San Francisco has made nearly 10,000 such pipes, each signed, numbered, and sold personally. 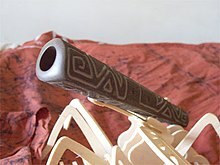 In "reasoning sessions" and grounations, the ritual chillum used is made of a cow's horn or conical wood piece, fitted with a long drawtube giving the smoke time to cool before inhalation. ^ a b Dunhill, Alfred (1924). The Pipe Book. London: A. & C. Black. Look up चिलम in Wiktionary, the free dictionary. This page was last edited on 15 January 2019, at 19:57 (UTC).